Srimati Karuna will bring to each of the seven sessions pertinent teachings from the tradition of Kriya brought to us by the masters of enlightenment. She will also emphasize the essential understandings necessary for those who aspire to the life of Kriya. Basic to the practice of Kriya is knowledge of Prana, the sacred breath of life; AUM, the sacred word-holy vibration, and meditation on Light. This series is not a "course." Its purpose is self-realization and individual sadhana. Kriya is open to everyone who aspires to the life, practice and ideal of Yoga. Each week our subject will be presented with reference to the traditions and spiritual heritage of Kriya meditation. Mrs. Amita Sarin taught several courses on Indian architectural history and sacred architecture as an adjunct lecturer at the University of Maryland and Georgetown University. She also led tours to India for many years for the Smithsonian Institution and other organizations. Dr. S. Selvin Kumar earned his PhD in history from Madurai Kamaraj University, where he taught as a lecturer in medieval history. He has authored books on the cultural history of India and specifically on the history of Madurai. In the US he has worked to promote the study of Tamil culture through the International Tamil University and he provides educational service and philanthropy in India and abroad. "Dear America / پیارے امریکہ / प्रिय अमेरिका: Translation and Transformation in the Art of Lubna Zahid"
Lubna Zahid is a classically trained fine artist who works in mixed media. Strongly influenced by contemporary and classical calligraphy in Urdu, Arabic and Persian, her pieces include texts in these languages. She experiments with bold renditions of Islamic decorative forms such as the Shamsa. Her work is inflected deeply by the works of masters like Mansoor Rahi, Sadequain, Dulac, Klimt and Kahlo. Typographic elements in her works rely heavily on the progressive post-colonial movements in the Muslim world in the 20th century. The philosophical works of thinkers like Allama Iqbal and Faiz Ahmed Faiz shaped her generation and their ideas are evident in her pieces. Lubna has exhibited her work in the United States and in Pakistan. She teaches workshops and seminars on art and art history in various venues including the Smithsonian’s Freer and Sackler Galleries. She lives in the Washington, D.C. area. The Gandhi Memorial Center will remain closed the Friday and Saturday before Christmas and the Friday and Saturday before New Year’s Day. 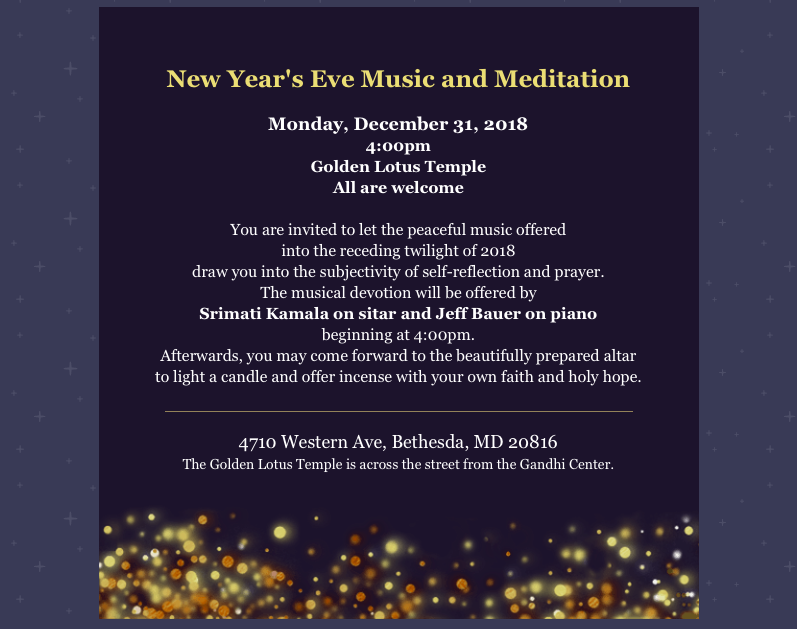 But please join us for the New Year’s Eve Meditation on December 31 at 4pm. 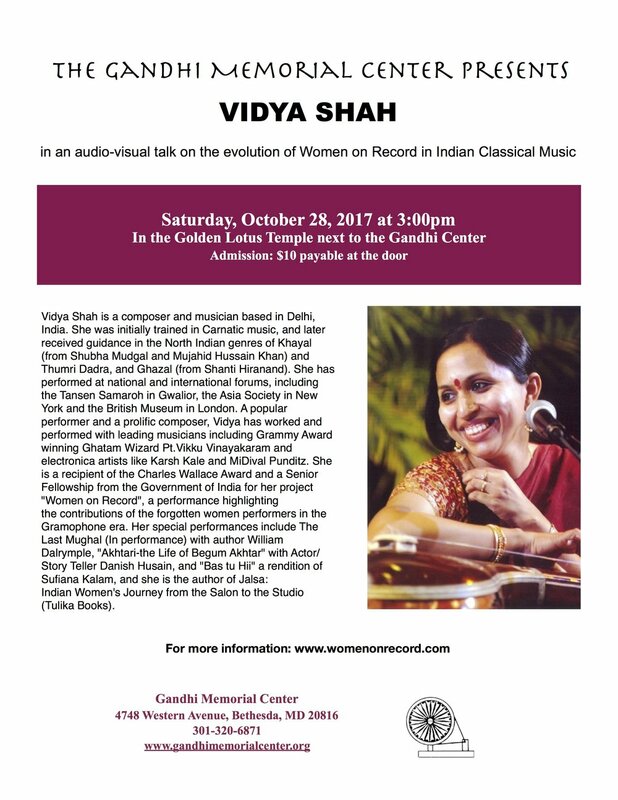 Anirudh Alva Changkakoti, the son of Dr. Rupak Changkakoti and Sarojini Alva Changkakoti, is a young promising tabla player from Virginia. Anirudh’s love for tabla was evident from childhood when his father was learning from Dr. Narendra Verma, disciple of the illustrious Ustad Allah Rakha of the Punjab Gharana. Dr. Verma started teaching Anirudh at the age of three years. Anirudh has won many awards of excellence in both state and national level contests in the US.He has performed across the US, Canada, and India and in prestigious venues such as the Kennedy Center. He has recorded with multiple Grammy nominated artists and Grammy winners. He has also appeared on national television channels in India. Through his Guru’s referral, Anirudh has been training under the maestro, Ustad Zakir Hussain for the past nine years. 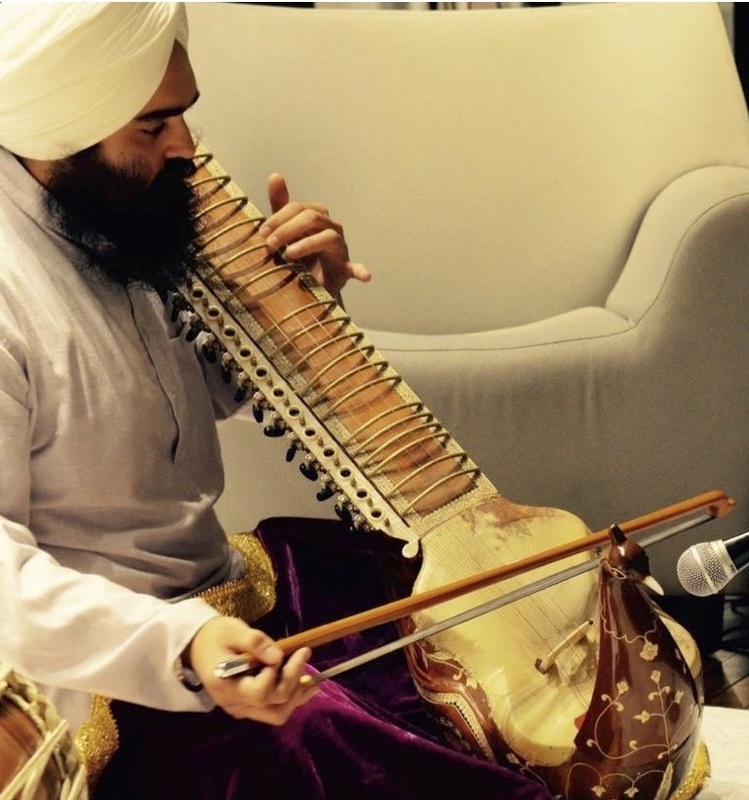 Preetinder Singh Dhindsa started his Sikh music education in 2004 from GAISS (Guru Angad Institute of Sikh Studies). He has learned from world renown Sarangi player, Ustad Surjeet Singh ji and world renown Taus player, Ustad Ranbir Singh ji over the past 10 years. In 2012, Preetinder joined the tutelage of Yogi Professor Surinder Singh ji, from whom he is currently learning the art of Naad Yoga and the healing properties of sound. He has performed across the globe with many world renowned artists. In 2015, Preetinder had the honor of performing at the White House. Treading a spiritual path is a pilgrimage—be it to a sacred location or to a blissful state beyond this world. One type of pilgrimage can lead to another. A spiritual journey may be to a mountain, a river, a temple or mosque, or to a peaceful place in our mind. The journey may entail sacrificing wealth and comfort, cleansing of body and mind, or igniting the spirit of generosity and living in harmony. Tilak Hettige will discuss the essence of diverse spiritual journeys from different religions. With firsthand knowledge of several unique and unknown pilgrimages, Tilak will take you on a spiritual path traversing his corner of the world. They may lead to high mountain tops, flow down rivers and seas, or span an entire island. For example, the Hindu pilgrims to Mount Kailash, standing behind a sea of mountains where India and Tibet meet, believe that only persons with a pure heart can climb this sacred mountain. Similarly when climbing some 5500 steps to Adams Peak (Sri Pada) in the middle of the hill country in Sri Lanka, Buddhist, Hindu, Muslim and Christians spread love and kindness among fellow pilgrims. All believe that footprint of their spiritual leader is imprinted on a rock atop this mountain. Down at the sea level, in some regions there are several spiritual journeys that are associated with a sacred location in a river. Kumbh Mela which is celebrated every 12 years is one such festival where millions of Hindu devotees gather in one of four locations and walk along a bank of a holy rivers in India, to wash away their sins forever. Another is the annual multi-religious foot pilgrimage across the length of Sri Lanka, in the months of July and August. This journey culminates in bathing and other rituals at the sacred city of Kataragama in southern Sri Lanka. It cultivates harmony among religious groups, peaceful acceptance of others and transcends to inner peace. There are other pilgrimages that traverse a whole island or parts of islands. The Muslim pilgrimage of tombs of influential Muslim religious leaders, located in northern Java, Indonesia promotes teaching of the leaders who spread religion in the country. Once a year, Christian fishermen of Sri Lanka and India gather to celebrate the year past and pray for the next at St. Anthony’s Church in the uninhabited island of Katchatheevu. In Shikoku island of Japan, a Buddhist pilgrimage that traverses 88 temples spread over 750 miles in four provinces is likened to the path of enlightenment that brings ultimate bliss. All are welcome to join us for the 149th birth anniversary observance of Mahatma Gandhi in the Golden Lotus Temple. 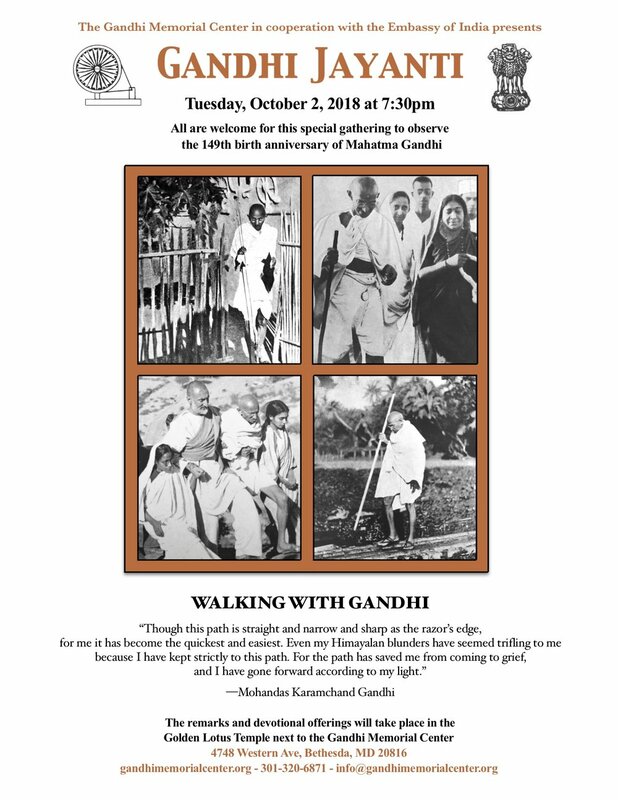 Special remarks will be offered by the Deputy Chief of Mission of the Indian Embassy, Mr. Santosh Jha and by the Director of the Gandhi Memorial Center, Srimati Karuna. Bharatnatayam dance innovation will be offered by Suchitra Akmanchi. 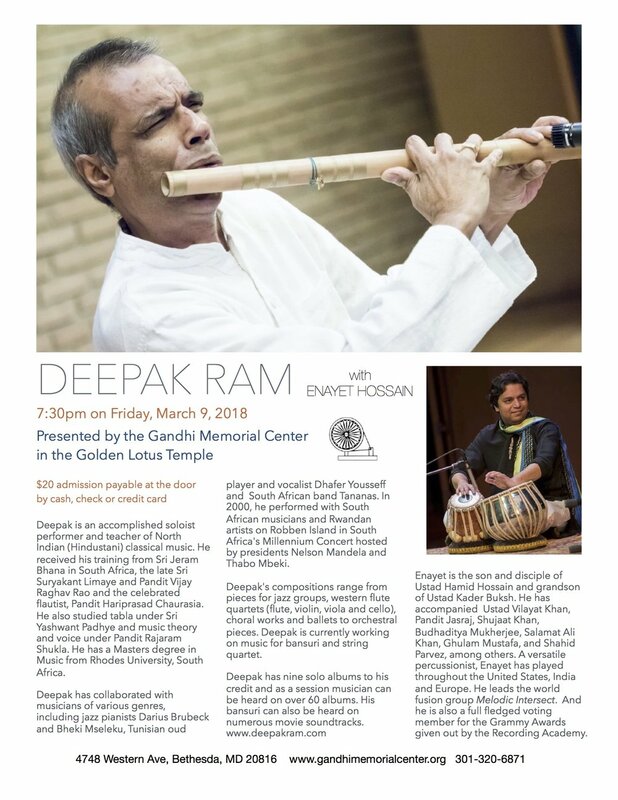 Devotional music offerings will be offered by Samia Mahbub Ahmad, Monir Hossain, Jeffrey Hallam Bauer, Tony Ventouris, Anthony Hyatt, Pam Broene, Sudeshna Basu, Fred Dixon, and Jacki Rockwell will be shared in commemoration of the life message of Mahatma Gandhi. The Gandhi Memorial Center closes for the months of July and August in order to give our volunteers a little time off to enjoy the summer. If you wish to contact us, please do send us an email and we will response to messages as soon as possible. Thank you! All are invited to let the peaceful music offered into the receding twilight of 2017 draw us into the subjectivity of Self-reflection. At sunset, following Kamalaji's lead, each person may proceed to illumine a candle, in the prayerful light of faith and holy hope, and offer an incense of fragrant devotion at the beautiful altar prepared for your silent invocation. All are invited in worshipful fellowship of Soul. 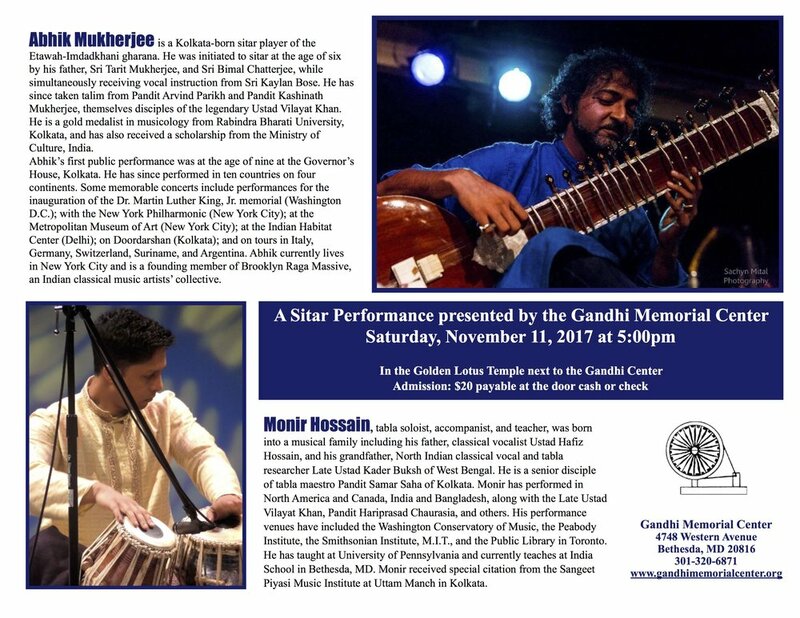 Indian classical music with Alif Laila on sitar, Abir Hussain on sarod and Anirudh Changkakoti on tabla. The Gandhi Memorial Center is closed for the the summer months of July and August and will reopen in September.